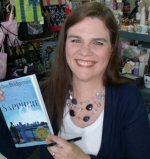 Every Sunday, my clever husband offers me a “day of rest” by writing posts, usually on the subject of his primary ministry. I pray this post touches you or speaks to you in some special way. Have you ever heard that there is no such thing as Brontosaurus? “What?!? !” You ask, aghast and amazed. Perhaps if a Creationist makes this proclamation, you mock him for his obvious ignorance. After all, you have known that Brontosaurus was real ever since you were a small child. What about Dino, Fred and Wilma Flintstone’s rambunctious pet Brontosaurus? 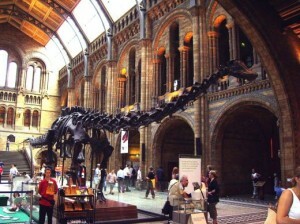 And, the Natural History museum at the Smithsonian displayed a full sized Brontosaurus skeleton for decades. No such thing as Brontosaurus indeed! In the late 1800s, Othniel Charles “O.C.” Marsh, the distinguished paleontologist who discovered the Brontosaurus, was feverishly scouring the American West looking for new dinosaur species, lest he be beaten to the punch by his arch-rival, Edward Drinker Cope. 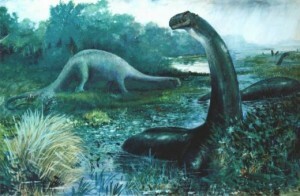 The rivalry between these two drew popular notoriety and became known at the time as the “Dinosaur Wars.” So determined were the two men to out-do each other in their competition for new finds, that between the two of them, Cope and Marsh discovered half the vertebrate fossils known as of 1900. 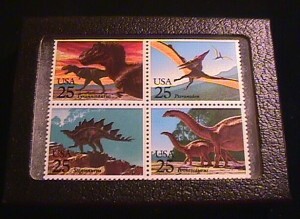 Unfortunately, the “Dinosaur Wars” occasionally resulted in (at best) slipshod work and (at worst) intentional fraud. Way back in 1877, O.C. dug up a skeleton of a largish lizard which he quickly named Apatosaurus. Then, in 1879 O.C. dug up the skeleton of a similar but much larger animal that was complete in every respect except one – it had no head. Apparently, never one to get stuck on the details, O.C. continued to rummage around until he found a couple of skulls that looked like they might fill the bill. Voila, ladies and gentlemen, the Brontosaurus was invented — um — discovered. Of course, there were a few problems with the Brontosaurus skulls. One skull was found a mere four miles away from the main skeleton. You might ask, “Just how fast was that train going that hit Brontosaurus?” But wait. Don’t ask, yet, until you learn the second skull was found a ridiculously small distance of a scant 400 miles away. Moreover, the Bronto skulls were found near the skeletons of another type of dinosaur called the Camarasaurus. In fact, they looked an awful lot like Camarasaurus skulls. How nearby were they found? Well, a few feet away from the Camarasaurus skeletons. Not even leagues or miles. In essence, O.C. was asking the world to believe, that “somehow” a whole pack of Camarasauruses (Camarasaurusi?) came along, spied our dead Brontosauruses (Brontosauri? ), noticed how much the corpse looked like themselves, hacked off its noggin, and dragged it along with them until such time as they, too, traveled beyond the pale and cast off this mortal coil. Needless to say, like every good Darwinist who perpetrates a fairly blatant act of fraud whilst committing these hoaxes, O.C. kept completely silent about the distances the skulls were found from the remainder of Bronto’s skeletons in his scientific paper on the subject. His colleagues — ever hopeful that they were drawing more and more near to that fabled missing link — chose to believe his story entirely, and the paleontological equivalent of the unicorn was born. It was such a compelling story, the composite skeletons were mounted in Yale’s Peabody Museum for decades, never even announcing that the entire thing was a bone chimera. To be fair, questions about the authenticity of Brontosaurus as an independent species began to surface fairly soon. In fact, the problem with the authoritative and scientific sounding name got straightened out in 1903, at least for scientists, when it was pretty firmly established that the Brontosaurus was the adult version of the Apatosaurus, which O.C. Marsh had also discovered way back in 1877. Skull fraud notwithstanding, the Apatosaurus was seen as a juvenile version of the “Brontosaurus” and so they were each re-christened Apatosaurus. 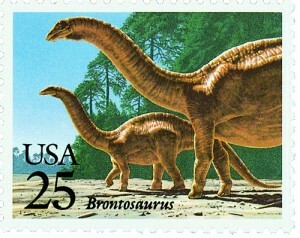 The term Brontosaurus thus lost its official authoritative and scientific sounding standing, replaced by the authoritative and scientific sounding name Apatosaurus. Even so, the name Brontosaurus stuck in people’s minds, in popular literature, in popular culture (“Hey, Barney. 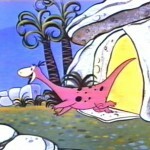 You want another Bronto-Burger?” Fred Flintstone) and chances are it’ll survive in popular usage for a long, long time. Nearly everyone knows the cartoon “dog” belonging to Fred, Wilma, and Pebbles Flintstone and everyone knows he is a brontosaurus. How about another Dino the dinosaur, and yet another Brontosaurus, who became the mascot for Sinclair Oils in 1932 when he was registered as a corporate trademark. 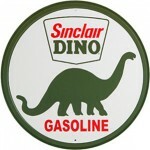 People thought that the Brontosaurus represented power, endurance, and stamina, which are the qualities that Sinclair Oil Corporation wanted people to associate with their products. The deal with the dinosaur heads, and the admission that O.C. had committed fraud, was a bit more complicated. In 1909 researchers for the Carnegie Museum of Natural History began digging up what turned out to be a pair of Apatosauruses in Utah. Near the neck of one, but detached from it, was a skull. It was not, however, a Camarasaurus-type skull, but rather looked like that of another big lizard, the Diplodocus. In a 1915 paper, Carnegie Museum director William Holland hinted that perhaps O.C. Marsh had “inadvertently” given the Apatosaurus the wrong skull. The problem was — nobody listened to him, since Marsh was still held in high esteem. In 1936 another paleontologist named Charles Gilmore reviewed Holland’s claim. Unfortunately, by this time, the original Diplodocus-type skull had gotten mixed up with a smaller skull that probably belonged to an actual Diplodocus. (Darwinists seem to have real problems with all kinds of skulls.) Since the second skull was obviously too small, Gilmore dismissed the idea that it belonged to Apatosaurus. It wasn’t until the 1970s that two researchers, Wesleyan University physicist John McIntosh and Carnegie Museum associate curator David Berman, were finally able to get all the skulls straightened out. 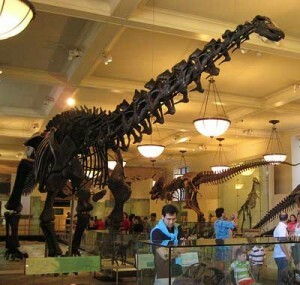 They assembled enough evidence to convince the scientific community to accept the truth, namely, that the Apatosaurus had a Diplodocus-type head rather than a Camarasaurus-type head. Museums around the country subsequently began modifying their skeletons accordingly– except for Yale’s museum which still, to this day and at the time of this writing, has not updated their original specimen. Can’t find a “missing link?” No problem. Mix a few fossilized skeletons together until you achieve the desired result. How many times has this happened from Piltdown to Archeoraptor to Brontosaurus? Can’t find evidence to support a defunct theory that is nearly devoid of logic, scientific evidence, or proof? No problem. Manufacture evidence that fits the theory. Perpetrate a fraud. Commit a hoax. Like I said. NO PROBLEM. This apparently amounts to the modern scientific process — if you are a Darwinist. Question. In what universe is it even slightly plausible that a skull found hundreds of miles away belongs to a decapitated skeleton? Answer. In the universe of the devout Methodological Naturalist, often a Secular Humanist, and definitely a Darwinist. That’s where. The ability to keep an open mind means you can evaluate the evidence on its MERIT without manufacturing any evidence or basing any conclusions upon baseless assumptions. Darwinism is a very good definition of a closed mind. Anything outside of random nature is automatically excluded — closed out — as a possibility. Clearly, this does not amount to a logical argument. 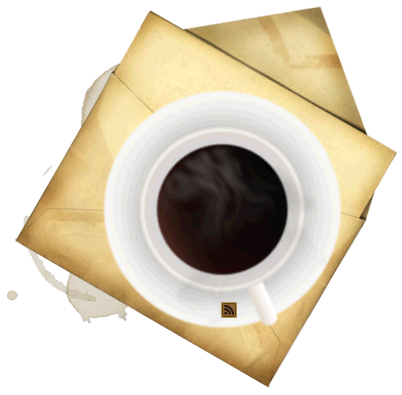 Occam’s razor dictates that the simplest and most likely solution to any problem is most often the correct solution. Darwinism requires layer upon layer of often contradictory and always rather complex assumptions based on often incorrect assumptions in a hierarchy that is riddled with fraud, hoax, lie after lie, and just plain slipshod work. The arguments that support the conclusions are complex, convoluted, and far from elegant. This is the opposite of the observable universe. What we observe is simplicity, very conservatively and ingeniously designed structures and processes, and elegant engineering. Even non-believers admit that there is an inference of design in the observable universe, though devout atheists such as Richard Dawkins explicitly caution their acolytes to “not be fooled” into thinking this is “actual” design. I wonder what his motivation is, there? And of course, he is obviously wrong. One can see that if one merely keeps an open mind. Besides, we all know mere observation proves nothing. You need to just believe! Dinosaurs lived millions of years ago; we don’t need proof. A lawyer (Charles Lyell) told us that back in 1830. You need to believe it or you are stupid. Most actual dinosuar and especially “humanoid” fossils are under lock and key anyway. Very few modern scientists ever get the chance of studying these finds first hand. They must rely on the integrity of the discoverer, other’s “first-hand” accounts and “reliable” reproductions. As we have seen throughout the past two centuries, integrity doesn’t always trump fame and fortune; in fact quite the opposite tends to be the norm.